British First Army undertook to reorganize its 5 Corps front while the enemy's attack was being prepared, partly to restore the many small units separated from their parent organizations and partly to achieve the long-deferred establishment of a substantial First Army reserve. The withdrawal of 10th Panzer Division from positions along the northern front into a mobile reserve farther south, the arrival of the British 46th Division, in the forward area, and the introduction into the French sector of elements of the U.S. 1st and 34th Infantry Divisions--all made it possible to consider withdrawing the British 6th Armoured Division from the Bou Arada valley into army reserve. The division was to be refitted near Rhardimaou with new Sherman tanks which were being brought in via Bône, and was to relinquish its own lighter tanks for use by the French. Orders on 12 February specified relief of the British 6th Armoured Division between 15 and 28 February; the 16/5 Lancers had already begun to leave its old tanks at a depot at Ebba Ksour on 12 February preparatory to receiving the Shermans.4 Forward areas would be held during the reorganization by a smaller concentration of infantry than heretofore. To offset this weakness General Anderson prescribed that each likely route of approach by enemy armor be heavily mined, that the mine fields be covered by infantry and artillery, that a mobile reserve be kept in each sector, and that observation be continuous and be supplemented at night by energetic patrolling. The much desired army reserve, once in being, would make it possible to counter each Axis thrust without improvising formations for each defensive operation. Combat Team (Col. Ray C. Fountain) farther west was then diverted to the vicinity of Hadjeb el Aïoun. The 34th Division (General Ryder) took control as the enemy's attack started. 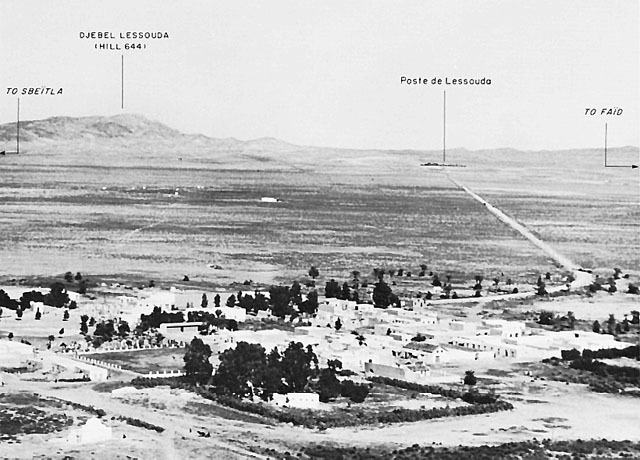 Headquarters, U.S. 1st Armored Division, near Sbeïtla and the division reserve there were connected through Kasserine with French and American units at Fériana, Gafsa, and El Guettar. At Fériana, a small force of all arms was assembling under command of Colonel Stark. At Gafsa, and southeast of it at the village of El Guettar, was the extreme south wing of the active Allied front. The Allied high command, after some irresolution, determined that Gafsa could not be strengthened enough to hold it against any probable enemy force. In case of necessity, the Gafsa force would be evacuated toward Fériana, where a counterattack in sufficient strength could be mounted. 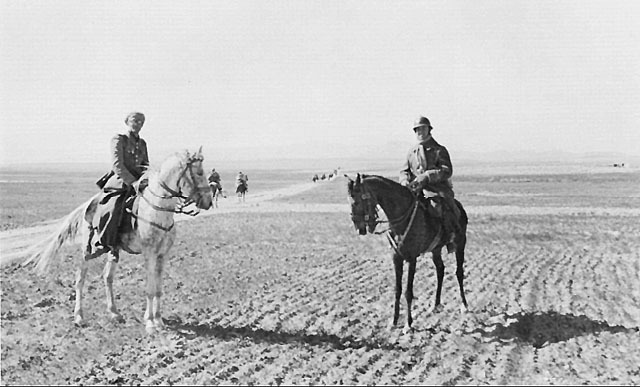 In the Advance Headquarters, II Corps, at the Hotel de France in Gafsa, Col. Frederic B. Butler relieved General Porter and with Colonel Morlière of the Constantine Division directed operations by a mixed American and French command as far as El Guettar.7 The arc from Sbeïtla through Kasserine and Fériana to Gafsa and El Guettar was screened to the east and south by security detachments and beyond them, by roving patrols. The latter were conducted for II Corps by Squadrons B and D, 1st Derbyshire Yeomanry. 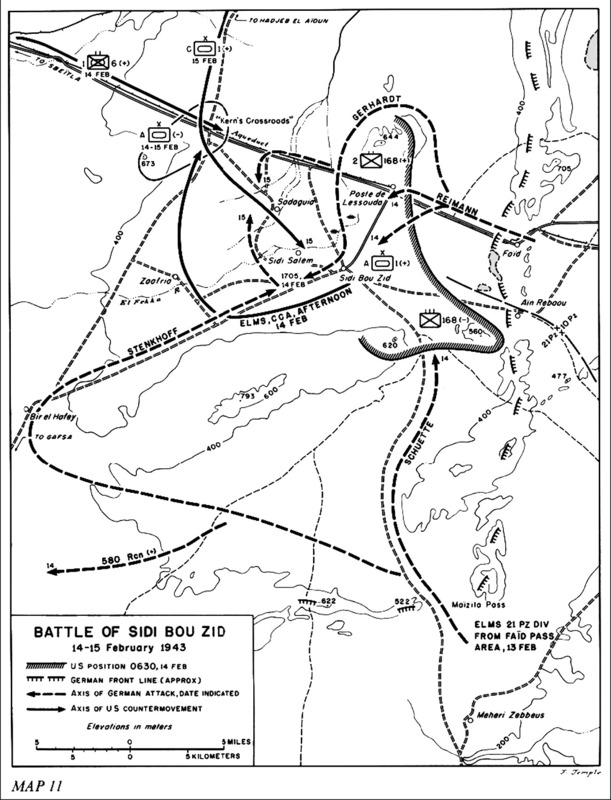 The enemy had considered making the forthcoming attack ever since Rommel in November first pointed out the advantages of combining his retreating force with that already in Tunisia in order to gain the margin of superiority necessary for a drive into Algeria.9 On 4 February, when the volume of logistical support to Tunisia had not yet reached a level which could sustain a drive for long, Rommel revived his suggestion in another memorandum to Comando Supremo. Rommel then proposed that he leave part of his army at the Mareth Position in order with its mobile portion to strike Gafsa from the southeast while mobile elements of von Arnim's command hit simultaneously from the northeast.10 The situation, Rommel believed, was temporarily propitious. The longer the attack was postponed, the greater the likelihood that the British Eighth Army could hamper its full execution, and the stronger the American forces to be overcome. On the other hand, should no such attack be attempted, the Allies would be far more likely to succeed in pinning down von Arnim's army while striking that of Rommel from both the front and the rear. The conditions for success therefore seemed to be: swift and surprising attack within the next few days; concentrated attack by superior forces; and unified command disregarding the boundary between the two Axis Army zones. The German high command had already formulated plans to establish a unified command when the presence of two Axis armies in Tunisia made such a headquarters necessary, but at this juncture, conditions made them unready to put those plans in effect. Operations as aggressive as those which Rommel was advocating would lack the degree of control essential to success. 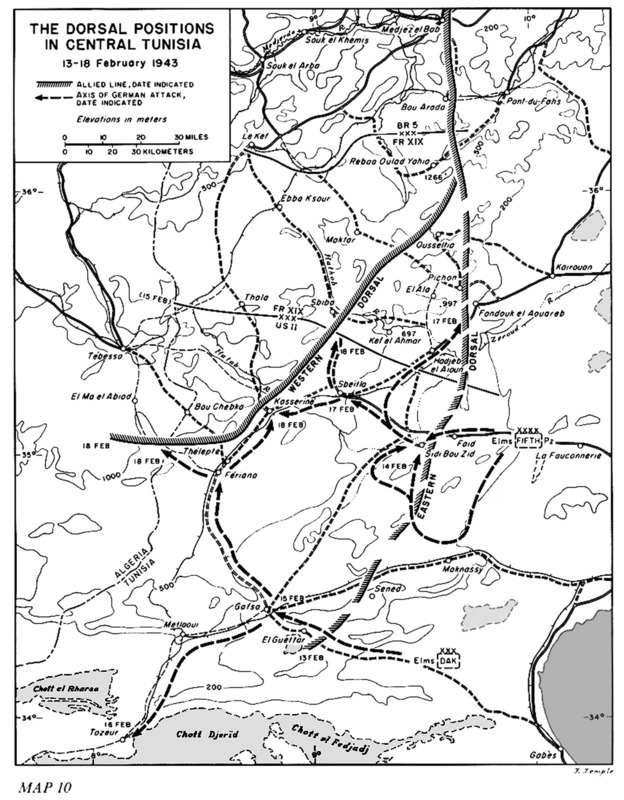 As soon as possible, Axis strategy required the extension westward of the bridgehead near Tunis so that it embraced at least the Djebel AbiodñMedjez el Bab road. The plans for the attacks on Sidi Bou Zid and Gafsa were therefore essentially defensive in concept. Because the Axis command left the ground forces to be co-ordinated rather than commanded, a swift adjustment of plans to take advantage of opportunities could not be made. to the forthcoming attack. But since its tanks had lighter armor and guns of shorter range, it would have to outnumber its opponents in a battle if its opposition was to be effective. 37-MM ANTITANK GUN (M3A1) AND CREW wait for the expected enemy column through Faïd Pass, 14 February 1943. Combat Command A was waiting for the enemy column which came through Faïd pass at 0630, 14 February. Plans had been prepared to cope with possible enemy moves through that defile or through the gaps immediately north or south of it. 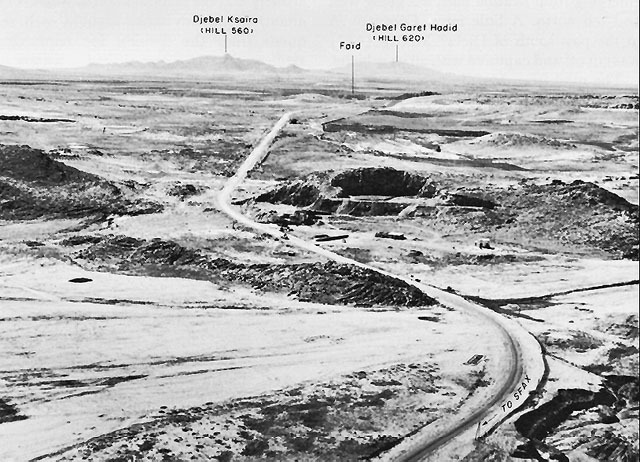 In compliance with the II Corps orders of 11 February, a "Lessouda Force" of infantry, tanks, artillery, and tank destroyers, commanded by Lt.
Col. John K. Waters, executive officer of the 1st Armored Regiment, had been stationed on Djebel Lessouda, north of Sidi Bou Zid.24 Engineers assisted in preparing defensive positions on the hill. The force sent out patrols each night. The tanks, tank destroyers, and artillery occupied varying positions on the flat during the day, and retired after dark to others within the defensive area where they remained until just before daylight. The Lessouda Force was expected to block an attack until a mobile armored reserve of about forty tanks (3d Battalion, 1st Armored Regiment) under Lt. Col. Louis V. Hightower, stationed nearer Sidi Bou Zid than the Lessouda Force, counterattacked. 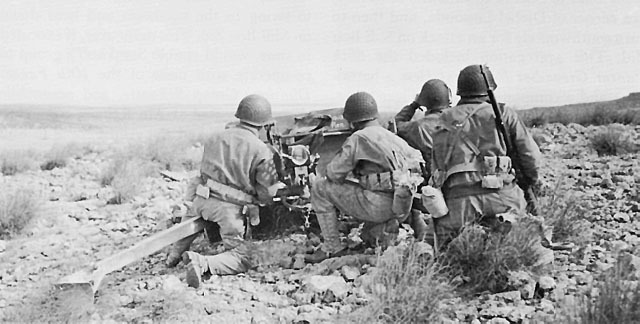 An artillery-infantry observation post on Djebel Lessouda was in communication with the command posts of both Lessouda Force and Combat Command A, 1st Armored Division, in Sidi Bou Zid. warned from Djebel Lessouda that about twenty Mark IV tanks were at Poste de Lessouda, apart from whatever force was still engaged near the pass. The American armored force under Colonel Hightower came within sight and range of the enemy a few minutes later, and was subjected to fire from what were believed to be 88-mm. guns and from perhaps as many as four Mark VI Tiger tanks. Hightower's men might have cleared up doubts concerning the strength of the enemy, but they were outranged and were unable to drive him off or destroy him. The next discoveries reported from Djebel Lessouda were that the first engagement near the pass had ended without information of what had become of Company G, 1st Armored Regiment, and that there was movement toward the northern end of the hill by an enemy force of eighty armored vehicles and trucks. By 0900, the enemy's strength already on the western side of Djebel Lessouda was described as thirty-nine Mark IV tanks, perhaps a few Mark VI's, and mobile infantry. This force moved very slowly southward toward the road from Faïd to Sbeïtla, firing on the slopes of Djebel Lessouda as it passed. Colonel Hightower was warned of the approach of this second force which might cut him off. He redirected Company H, 1st Armored Regiment, to delay the enemy, and with Lt. Col. Charles P. Summerall, Jr.'s, 91st Field Artillery Battalion (less Battery B, which had been in the path of the first attack and was now about to be caught again, this time from the rear) opposed this strong northern prong of the enemy attack by fire and maneuver. American losses were heavy, and, in the last hour of the morning, the unequal contest ended in a withdrawal southwestward. emerging from Maïzila pass, ten going west and ten north. A little later, Company A in the pass south of Djebel Matleg (477) was cut off and captured with all its vehicles. The road from Maïzila pass to Sidi Bou Zid ran between Djebel Ksaïra on the east and Djebel Garet Hadid on the west. The elements of Colonel Drake's command which moved onto Djebel Garet Hadid during the morning attack saw an enemy force of about thirty vehicles, approaching along this road at noon, a force they had been warned to expect. They engaged it in the defile, the skirmish continuing throughout the afternoon. This column, an advance element of Kampfgruppe Schuette was joined by the remainder of that group late in the afternoon.29 Meanwhile, Group Stenkhoff, the main force of the 21st Panzer Division, pushed along the northern edge of Djebel Meloussi (622) under the eyes of its commander, Colonel Hildebrandt, screened to the west and south by the 580th Reconnaissance Battalion. Progress was interrupted chiefly by muddy dips in the plain or mechanical failures in some of the vehicles. Opposition on the ground was nil. Group Stenkhoff reached Bir el Hafey on the GafsañSidi Bou Zid highway about noon, assembled, and at 1345 proceeded in force northeastward along the highway toward Sidi Bou Zid, some eighteen miles distant. Reports of the battle filtering through from General Ward's headquarters to that of General Fredendall near Tébessa were sketchy. The successive appearance of the enemy's armored groups left total numbers in considerable doubt. The reported loss of artillery and the identification of Mark VI's among the enemy tanks brought early requests from the division for reinforcing artillery. The II Corps shifted a battery of the 68th Armored Field Artillery Battalion and two platoons of Company A, 805th Tank Destroyer Battalion, from Fériana to Sbeïtla. SIDI BOU ZID, looking northeast. Command A, which might have been pursued and perhaps destroyed, was able to get away. SPAHIS WITHDRAWING FROM THE SIDI BOU ZID AREA, 14 February 1943. Allied divisional reserves at Sbeïtla consisted of the light tank battalion (1st) of the 13th Armored Regiment at about half-strength; the 1st Battalion, 6th Armored Infantry; Company B, 16th Armored Engineers; and two antiaircraft guns of Battery B, 443d Coast Artillery (AA) Battalion (SP). The French units in the area were not equipped with weapons suited to successful counterattack on an enemy who employed Mark IV and Mark VI tanks, 88-mm. dual-purpose guns, and other modern arms. For that matter, neither were the Americans, although they were far more fortunate in their armament and much more mobile than the French. from Combat Command B near Maktar. The arrangements were completed shortly after noon, 14 February. Alger's battalion took to the road that afternoon using the new twenty-two-mile route between El Ala and Hadjeb el Aïoun which had been constructed by American Engineers. General Eisenhower left II Corps headquarters late in the morning of 14 February and with Truscott and others drove to Constantine, sight-seeing at Timgad en route. The word of an attack at Sidi Bou Zid was not believed to indicate a major offensive. But as news came to the AFHQ advance command post on the next two days, General Eisenhower participated in the decision to hold Allied strength in central Tunisia and to evacuate Gafsa. The enemy's power and apparent intentions indicated that Gafsa could not be successfully defended but that there was time for an orderly withdrawal spread out over two successive nights. All supplies and transportation equipment could be removed and the place booby-trapped and mined. First Army's orders to bring back the French on the first night and the Americans on the second were questioned by II Corps on the ground that secrecy could not be maintained and that the enemy would interfere with the second night's operations. The actual evacuation of Gafsa was accomplished during the night of 14-15 February, a night of rather confused and excited activity, especially on the part of civilians who could remember the brief Axis occupation of the preceding November. The troops pulled back as far as Fériana. The medical services of the 51st Medical Battalion and 48th Surgical Hospital moved farther back. The railroad bridge north of Gafsa was prematurely demolished before all the rolling stock had been removed; it was therefore taken west to Metlaoui where it was concealed in a tunnel. In the old Kasba of the abandoned town six tons of French ammunition were blown up, unfortunately damaging adjacent buildings and injuring their native occupants.38 Last to leave Gafsa was the 1st Ranger Battalion. The movement to Fériana was covered on the east by Squadrons B and D of the 1st Derbyshire Yeomanry. Combat Command C, including Alger's 2d Battalion, 1st Armored Regiment, reinforced, after its arrival from Maktar, marched south from Hadjeb el Aïoun on 15 February over a fairly direct road to an assembly area northeast of Djebel Hamra.45 Leading elements reached the assembly area by 0945, but the column was strafed by enemy planes near the end of its march and did not complete reorganizing until just after noon, when it began the attack. From Colonel Stack's command post on Djebel Hamra, the battlefield stretched out below with unimpeded view for miles through the clear dry atmosphere of a sunny afternoon. Even through field glasses, Sidi Bou Zid, about 13 miles distant, was a tiny spot of dark hued evergreens and white houses behind which rose the hazy slopes of Djebel Ksaïra. At the left was Djebel Lessouda, toward which the road from Sbeïtla extended as straight as a taut string, and from which Colonel Waters radioed reports of what could be seen from its heights. On the right, the road from Bir el Hafey slanting northeastward to Sidi Bou Zid could be identified, and roughly parallel with it, the long ridge of Djebel el Kebar (793). There was considerable mirage. The dips and folds of the plain were for the most part gradual, but several steep-sided deeper wadies creased it in general from north to south. The monotonous brown-gray of the landscape was marked at various points by patches of darker cactus, by the geometric figures of cultivated fields and orchards, and by small clusters of low, block-shaped white buildings. At 1240 the attacking formation started over this expanse with great precision until its vehicles were reduced by distance to the size of insects, and obscured by heavy dust. A steady stream of radio reports from Djebel Lessouda and Djebel Ksaïra to Combat Command C via the 1st Armored Division described enemy movements and indicated that the Axis forces, although large, were considerably dispersed. Colonel Stack was urged to push on aggressively while he retained this advantage.48 Colonel Alger's tanks could cross the series of wadies in the path of attack only at a few points. Toward these crossings his armored units converged in temporary concentrations before again spreading out in attack formation. While Company D, 1st Armored Regiment, was reconnoitering to find a way across the first great ditch, at a point a little beyond the village of Sadaguïa on the left flank, a tank destroyer platoon entered that village and there the enemy's first resistance, a Stuka attack, knocked it out. The tanks, with one exception, crossed the first wadi successfully and after fanning out resumed the advance toward the second. As they arrived at the one good crossing point there, the enemy opened up with air burst and then with antitank artillery fire. On the northern flank, an enemy battery including four 88-mm. and two 47-mm. antitank guns had been waiting in concealment. Before their fire took effect, they were observed and overrun by the advance platoon of Company D, 1st Armored Regiment. The air burst, coming from artillery pieces emplaced on the shoulders of Djebel el Kebar and other vantage points to the southeast, forced the tank crews to "button up" and to continue movement with restricted vision. While Company E, in reserve, remained near the second wadi, Companies D and F, and the assault guns pushed on. Batteries B and C, 68th Armored Field Artillery Battalion, took up firing positions and began counterbattery fire, or shelled enemy tanks, in response to calls from forward observers in the leading American vehicles. As the infantry began to pass through the artillery, an air attack struck the area and threw the troops into some confusion. The tanks arriving at the third wadi came under much heavier fire, especially on the southern flank. Company D on the north was able to send tanks into the village of Sidi Salem, where they shot up the buildings and a motor pool to the east, and stopped the progress of an enemy tank force trying to pass the village's northern edge. But when Company D tried to emerge northeast of the village, heavy fire from the north drove the tanks back to cover. Company F moved toward the area south of Sidi Bou Zid along a route in defilade pointed out by Colonel Alger. Alger's tank, while heading back toward Sidi Salem to rejoin Company D, was knocked out. The radio operator was killed but the others survived, only to be captured. Company E, in the meantime, came forward and pressed toward the village and then, about 1630, encountered the spearhead of an enemy armored force striking from the northern flank. Company F became involved at about the same time against a similar thrust from the south. On either flank, the enemy sent additional enveloping forces. That at the south escaped detection until it had reached a threatening position from which it was finally driven off by Battery C, 68th Armored Artillery Battalion. The threat nonetheless remained and caused the attacking American forces to start a hurried withdrawal. The enemy's slowly advancing column, reinforced with Tiger tanks, heading toward the deep northern flank in the area of Kern's Crossroads, was reported from Djebel Lessouda in time for Combat Command C to commit its reserve company of medium tanks (Company G, 13th Armored Regiment) to try to intercept it. The company took a course too far to the northwest and missed the enemy, who turned southward into the battle area, thus avoiding also some long-range fire from the 91st Armored Field Artillery Battalion near Djebel Hamra. The Allies were slow to realize that they had lost another tank battalion. The enemy's motor pool near Sidi Bou Zid continued to burn into the night, but the Americans interpreted it as a group of German tanks. "We might have walloped them or they might have walloped us," reported General Ward to II Corps as late as 2230 hours that evening. Through messages dropped by air on Djebel Lessouda before darkness, he had, however, ordered Colonel Waters to get his force back during the night.51 The enemy had been surprised at the weakness of the counterattack and remained alert for a second wave of attack. He knew exactly from captured orders the units which had been fighting thus far.52 The Allies, however, were maintaining a defense line near Kern's Crossroads east of Sbeïtla and reorganizing for defense, as already noted. In fact, at the highest levels a decision of the greatest moment to subsequent operations had been made during the day. 1. (1) MS # T-3 (Nehring et al. ), Pt. 3a. (2) AFHQ Rpt, G-2 Estimate of Axis Offensive Capabilities After Panzer Armee Rommel Is in Occupation of the Mareth Line, 7 Feb 43. AFHQ Micro Job 26, Reel 72 Spec. (3) Msg 1784, USFOR to FREEDOM, 1700, 17 Feb 43, sub: Axis forces in North Africa. Non-Current Permanent Rcd File, Misc Cbls--1942ñ43, AG 311.22. (4) II Corps G-2 Estimate 8, 7 Feb 43; II Corps Periodic Rpts 39, 13 Feb 43, and 40, 14 Feb 43; 1st Armd Div G-3 Periodic Rpts 16, 9 Feb 43, and 18, 11 Feb 43. (5) DMC Jnl, 9 Feb 43. (6) Msg, XIX Corps to II Corps (G-3), 2100, 9 Feb 43, in II Corps G-3 Jnl, 0641, 10 Feb 43. (7) Interv with Col B. A. Dickson (Ret. ), 13 Dec 50. 2. (1) Ltr, Eisenhower to Fredendall, 4 Feb 43. OPD Exec 3, Item 1a. (2) Msg, Adv CP Allied ASC to CinC AF, 6 Feb 43. AFHQ CofS Cable Log, 46. 3. Dir, CinC AF to CG First Army, 11 Feb 43. AFHQ G-3 Opns 58/2.1, Micro Job 10C, Reel 188D. 4. (1) First Army Ops Instruc 14, 12 Feb 43. DRB AGO. (2) Info supplied by Cabinet Office, London. 5. (1) 133d Inf and 135th Inf Hists. (2) 1st Inf Div G-3 Rpt of Opns, 15 Janñ8 Apr 43. (3) XIX Corps Jnl, 1ñ13 Feb 43. 6. (1) II Corps AAR, 2 May 43. (2) 1st Armd Div Tank Status Rpt, 12 Feb 43, Entry 210 in II Corps G-3 Jnl. 7. (1) II Corps AAR, 2 May 43. (2) Msg, Truscott to AFHQ G-3, 6 Feb 43. AFHQ CofS Cable Log, 49. (3) Phone Conv, CG First Army to G-3 II Corps, 1355, 8 Feb 43, in II Corps G-3 Jnl. (4) II Corps FO 1 (Stark Force), 14 Feb 43. (5) DMC Jnl, 9 and 12 Feb 43. (6) Interv with Brig Gen Frederic B. Butler, 11 Jan 50. 8. (1) II Corps G-3 Jnl, 14 Feb 43, Entry 306. (2) XIX Corps Jnl, 13 Feb 43. (3) Ltr, Eisenhower to Marshall, 16 Feb 43. Copy in WDCSA 381 Africa. (4) Generals Patton and Smith were at Eighth Army headquarters in Tripoli; General Clark was ill; and General Alexander and Air Chief Marshal Tedder had not yet assumed their new commands. 9. See pp. 322-23 above. 10. Memo, German-Italian Panzer Army to Comando Supremo, 4 Feb 43, in Panzer Army Africa, KTB, Anlagenband 8, Anlage 995. A blow through Gafsa and Sbeïtla on Tébessa was earlier described as an objective of second priority on 19 January 1943 in OKW/WFSt, KTB, 19 Jan 43. 11. Panzer Army Africa, KTB, Band 2, 3-13 Feb 43. 12. Rad, Comando Supremo to German-Italian and Fifth Panzer Armies, 8 Feb 43, in Panzer Army Africa, KTB, Anlagenband 8, Anlage 1016. 13. (1) Panzer Army Africa, KTB, Band 2, 9 Feb 43. (2) MS #T-3-P2 (Kesselring), Pt. 2. (3) MS #C-075 (Kesselring), comments on MS #T-3 (Nehring et al. ), Pt. 3a. 14. Memo, Kraeftegegenueberstellung, 19 Feb 43, in OKH/GenStdH/Op Abt, File Tunis, 10.XI.42-2.V.43. 15. (1) 1st Armd Div Tank Status Rpt, 12 Feb 43 Entry 210, in II Corps G-3 Jnl. (2) Ltr, Eisenhower to Marshall, 21 Feb 43. Copy in CinC AF Diary, Bk. V, p. A-240-2. 16. (1) Rad, Comando Supremo to Fifth Panzer Army and Panzer Army Africa, 11 Feb 43, in Panzer Army Africa, KTB, Anlagenband 8, Anlage 1038. (2) Panzer Army Africa, KTB, Band 2, 11-13 Feb 43. 17. Von Broich took command when General Fifth Panzer Army, KTB IV, 1 Feb 43. Fischer was killed on 1 February by an Italian mine. 18. FO, Fifth Panzer Army, Nr. 260/43, 8 Feb 43, in 21st Panzer Div, Ia, KTBñAnlagen, Nr. 9, 1.I.ñ31.III.43, Afrika (cited hereafter as 21st Panzer Div, KTB Anlagen, Band 9). 19. FO, 10th Panzer Div, 9 Feb 43, and supplement, 12 Feb 43, in 21st Panzer Div, KTB Anlagen, Band 9. 20. (1) FO, 21st Panzer Div, Nr. 102/43, 12 Feb 43, in 21st Panzer Div, KTB, Anlagen, Band 9. (2) Gefechtsbericht ueber die Kampfhandlungen im Abschnitt Faïd vom 13-18.II.43 (cited hereafter as Gefechtsbericht Faïd), in Fifth Panzer Army, Anlage zum Kriegstagebuch IV A (cited hereafter as KTB, Anlagen, Band IV A), 1.-26.II.43, Anlage 117. 21. (1) Panzer Army Africa, KTB, Band 2, 10 Feb 43. (2) MS # D-124, Beitrag zum Vorstoss ueber Gafsa gegen den Kasserine-Pass (Generalleutnant Freiherr Kurt von Liebenstein). 22. (1) Rpt, German-Italian Panzer Army to Comando Supremo, 16 Feb 43, in Panzer Army Africa, KTB, Anlagenband 9, Anlage 1081/4. The Gafsa operation was termed Unternehmen MORGENLUFT. (2) FO, Panzer Army Africa, Nr. 1, in Panzer Army Africa, Anlagenband 8, Anlage 1028/1. 23. (1) 21st Panzer Div, KTB, 13 Feb 43. (2) Gefechtsbericht Faïd. 24. It consisted of the 2d Battalion, 168th Infantry (reinforced) (less Company E); Company G, and Reconnaissance Company, 1st Armored Regiment; Battery B, 91st Field Artillery; and one heavy platoon of Company A, 701st Tank Destroyer Battalion. 25. (1) Rpt by Col Hains, 12 Mar 43, in 1st Armd Div Hist Rcds; 1st Armd Regt AAR, 10 Jul 43; CCA 1st Armd Div AAR, 23 Jan-26 Feb 43. (2) Interv with Col Hains, 26 Apr 51. 26. (1) See n. 24. (2) Ltr, Col Louis V. Hightower to Col Hamilton H. Howze (then G-3, 1st Armd Div), 1 Jul 46. In private possession. (3) Info supplied by Brig Gen Raymond E. McQuillin (Ret.). OCMH. 27. Ltr, Lt Col Henry P. Ward to Col Charles E. Hart, 16 Feb 43, in 17th FA Regtl Hist. 28. (1) II Corps G-3 Jnl, 14 Feb 43, Entry 314. (2) 1st Lt Frank S. Sears, Supply Operations in Combat, 1 May 48. The Artillery School, Gen Instruc Dept. (3) 21st Panzer Div, KTB, 13-17 Feb 43. 29. (1) 21st Panzer Div, KTB, 14 Feb 43. (2) Memo, Col Drake for G-2 WD, 14 May 45, sub: Account of 168th Inf Opns 24 Dec 42ñ17 Feb 43. DRB AGO. 30. Rpt by Gen Welvert, in DMC Jnl, 14 Feb 43. 31. (1) Entries 303, 307, 309, 334, 335, and 353, in II Corps G-3 Jnl, 14 Feb 43. (2) Ltr, Col Hightower to Col Howze, 1 Jul 46. In private possession. (3) 168th Inf AAR, 12 Nov 42ñ15 May 43. 32. This point was known thereafter to the 1st Armored Division as "Kern's Crossroads." 33. (1) Based on AAR's of CCA 1st Armed Div, 168th Inf, 3d Bn 1st Armd Regt, 1st Bn 6th Armd Inf, and Co A 701st TD Bn. (2) M. Sgt. Clarence W. Coley, A Day With the 1st Armored Division, 6 Jul 51, in George F. Howe, The Battle History of the 1st Armored Division (Washington, 1954), pp. 150-53. (3) Info supplied by Gen McQuillin, 13 Jan 51. OCMH. 34. (1) Rpt by Col Hains, 12 Mar 43, and Rpt by Col Hightower, 1 Jul 46, in 1st Armd Div Hist Rcds. (2) 10th Panzer Div, Ic, Taetigkeitsbericht, 14 Feb 43, lists the following Allied losses: 71 prisoners, 40 tanks, 7 armored personnel carriers, 15 self-propelled mounts, 1 antitank gun, 9 machine guns, 1 prime mover, 4 trucks, and 18 other vehicles. (3) The initial estimate of Combat Command A's losses in personnel was 62 officers and 1,536 enlisted men killed, wounded, or missing in action (see Msg, G-3 1st Armd Div to G-3 II Corps, 0745, 16 Feb 43, Entry 116 in II Corps G-3 Jnl). Of these, 573 were 1st Armored Division troops (see 1st Armd Div G-3 Jnl, 14 Feb 43). 36. (1) DMC Jnl, 14 Feb 43. (2) Phone Convs, Fredendall to Ward, 1250 and 1305, 14 Feb 43, Entries 318 and 330; Phone Conv, Anderson to Fredendall, 1300, 14 Feb 43, Entry 329; Rad, Adv First Army to II Corps, 1322, 14 Feb 43, Entry 346. II Corps G-3 Jnl. 37. (1) Phone Conv, Col Arnold with Col Williams, 1900, 14 Feb 43, in II Corps G-3 Jnl. (2) Info supplied by Cabinet Office, London. (3) Msg, Eisenhower to CCS (Review 30), 15 Feb 43, NAF 149. (4) Adv First Army Sitrep, 1700, 15 Feb 43. AFHQ CofS Cable Log, 97. 38. (1) Ltr, Eisenhower to Marshall, 16 Feb 43. Copy in WDCSA 381 Africa. (2) Msg O-409, Adv First Army to II Corps, 14 Feb 43. AFHQ CofS Cable Log, 96. (3) Msg, CG II Corps to CG First Army, 0035, 15 Feb 43, Entry 2, in II Corps G-3 Jnl. (4) Adv First Army Sitrep, 1700, 15 Feb 43. AFHQ CofS Cable Log, 97. (5) Memo, Brig Whiteley for G-2 and G-3 AFHQ, containing Phone Conv, Whiteley with Brig C. V. McNabb, 1850, 14 Feb 43. AFHQ Micro Job 26, Reel 71 Spec. (6) DMC Jnl, 14 Feb 43. (7) II Corps AAR, 2 May 43, par. 5. (8) 175th FA Bn War Diary, 14-15 Feb 43. (9) Msg, II Corps Surgeon to G-4 II Corps, 1950, 14 Feb 43, Entry 386, in II Corps G-3 Jnl. (10) Rpt by Capt John D. Upton, in 19th Engr Regt (C) Hist Rcds, Oct 42-Jan 44. (11) Interv with Brig Gen Frederic B. Butler, 11 Jan 50. 39. Msg, II Corps to CG 1st Armd Div, 2010, 14 Feb 43, Entry 369, in II Corps G-3 Jnl. 40. (1) XIX Corps Jnl, 14 Feb 43. (2) 19th Engr Regt (C). Hist Rcds, Oct 42-Jan 44. 41. Msg O-409, Adv First Army to II Corps, 14 Feb 45. AFHQ CofS Cable Log, 96. 42. Msg. CG II Corps to CG 1st Armd Div, 1120, 15 Feb 43, Entry 17, in II Corps G-3 Jnl. 43. Original in CCC 1st Armd Div Opns Jnl, Feb 43. 44. Msg, Lt Col Hamilton H. Howze to CCC 1st Armd Div, 1350, 15 Feb 43, and Phone Conv, Cols Williams, Hamlett, and Arnold, 1900, 14 Feb 43, in II Corps G-3 Jnl. 45. For the counterattack of 15 February 1943 at Sidi Bou Zid, Combat Command C consisted of: the 6th Armored Infantry (less the 1st and 2d Battalions); the 2d Battalion, 1st Armored Regiment, Company G, 13th Armored Regiment; the 701st Tank Destroyer Battalion (less Companies A and C); the 68th Field Artillery Battalion (less Battery A); the 1st Platoon, Company D, 16th Armored Engineer Battalion: the 1st Platoon, 443d Coast Artillery (AA) Battalion (SP); a detachment of Company B, 13th Armored Regiment; and Company A, 47th Armored Medical Battalion. See II Corps G-3 Jnl, 1420, 15 Feb 43, Entry 28. 46. CCC 1st Armd Div Jnl, 15 Feb 43. 47. (1) Gefechtsbericht Faïd, 15 Feb 33. (2) Interv with Col Hains, 26 Apr 51. 48. Msg, CG 1st Armd Div to CCC, 1422, 15 Feb 43, in CCC Jnl. 49. (1) CCC 1st Armd Div Jnl, 15 Feb 43. (2) 10th Panzer Div, Ic, Taetigkeitsbericht, 15 Feb 43. (3) Ltr, Col Drake to Gen Ward, 15 Jan 51. OCMH. (4) Interv with Col Hains, 26 Apr 51. (5) Rpt by Lt Col James D. Alger, The Attack on Sidi Bou Zid by the 2d Battalion, 1st Armored Regiment, 15 Feb 43. In private possession. 50. (1) Msg, CO CCC to G-3 1st Armd Div, 1348, 16 Feb 43, in CCC 1st Armd Div Jnl. (2) The Germans themselves claimed to have salvaged every tank of their own, but listed as American matériel captured or destroyed: 39 tanks, 17 armored personnel carriers, 4 antitank guns, 3 self-propelled mounts, 8 machine guns, 1 105-mm. howitzer, and about 100 vehicles. 10th Panzer Div, Ic, Taetigkeitsbericht, 15 Feb 43. (3) The estimate at 0325, 16 February, by G-3, 1st Armored Division, was 46 medium and 2 light tanks, 130 vehicles, and 9 self-propelled 105's. II Corps G-3 Jnl, 16 Feb 43; Entries 76 and 87. (4) See sketch map, Howe, The Battle History of the 1st Armored Division, p. 164. 51. Phone Conv, Gen Ward with Col Akers, 2220, 15 Feb 43, Entry 65, in II Corps G-3 Jnl. 52. (1) Lt Col James D. Alger, The Attack on Sidi Bou Zid by the 2d Battalion, 1st Armored Regiment, 15 Feb 43. In private possession. (2) 10th Panzer Div, Ic, Taetigkeitsbericht, 15 Feb 43.